Turning a creative idea into a concept is no easy feat — the process of generating an idea, creating a hypothesis, turning that into a thesis, and then transforming it into an actionable plan of design, development, and testing. 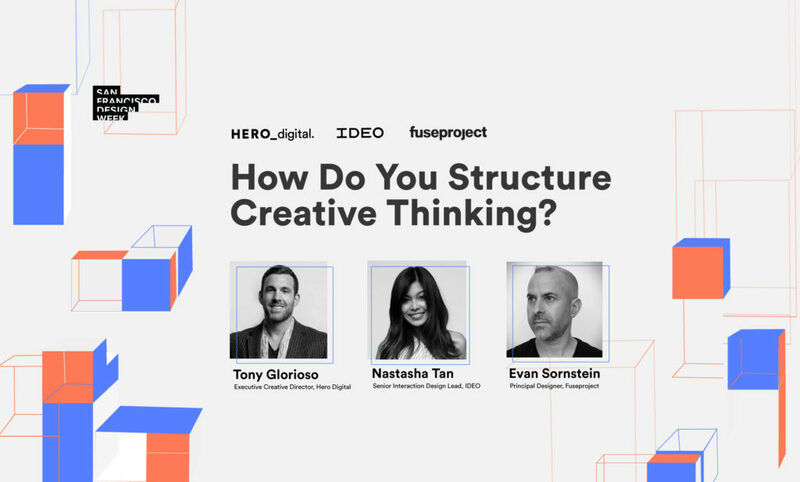 For San Francisco Design Week, Hero Digital hosted an amazing panel of design leaders who shared their journey, story, process behind creating inspiring ideas and crafting great products and experiences — moderated by Gianna Giancarlo, Director of User Experience at Hero Digital, she led the discussion with Evan Sornstein, Principal Designer at fuseproject, Nastasha Tan, Senior Interaction Design Lead at IDEO, and Tony Glorioso, Executive Creative Director at Hero Digital. It begins with a successful ideation session. At IDEO, Nastasha tries to think about participation and involve her clients in playful scenarios. Recently, to kickstart momentum for a complex and futuristic project she told clients to close their eyes and imagine that they were in a spaceship. What would be inside as they launched in space? What would they carry? Think about? Look forward to in space? By taking her clients out of typical roles, she created a framework to give people the opportunity to be playful and think more viscerally and less from a cognitive standpoint. This experience was then connected back to the design brief through analogies, such as thinking through the ergonomic points of a chair and the rich connections needed to stay connected to people at home. Create a story that depicts how you want the feeling to be expressed. At Hero Digital, Tony suggests starting with a story or narrative, then articulate it with mood boards or song lyrics and titles. What do you want it to feel like? What’s the ultimate story and emotion? For example, for Lions Club International, a leading humanitarian organization, Tony sparked the idea of perpetual action: imagine a bucket, where every drop of water creates a ripple of change and momentum. Off that momentum, there’s a sensation of time and space and ultimately the impact of lives throughout the world. This concept became the canvas as the project moved to methodology. Are you working in-house with a tight deadline to think outside the box? Evan suggests mirroring Kentucky Mixing, a concept in music where you find an existing song that sounds like the one you’re trying to create. You can do this by conducting rapid prototyping and/or creating mood boards to start dialogue early. Ask questions such as, “if you were a coffee shop or car company, what would you be?” Understanding the ballpark of expectations will save you a lot of time. Thank you again to all the SF Design Week attendees who joined us for this session and an extra shoutout to those who contributed to the conversation online. Shoutout to our Twitter competition winner, Amy Isobel! At Hero, we specialize in how to turning ideas into actionable plans and creating finished products. Contact us to see how we can make something amazing, together.